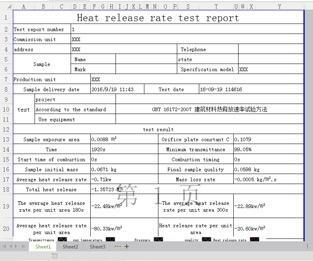 Combustion product stream through the oxygen concentration of the oxygen consumption and calculate the heat release rate, heat release rate of the material is also the material properties of the combustion products of the combustion burner of the most important parameters, more accurately measure the material during combustion heat release rate, for predicting fire hazard prevention and fire-retardant treatment is extremely important. 1. Cone-shaped radiant electrical heater, which is capable of heating power 5kw, radiation intensity: 100kw / m2, equipped with three thermocouples to measure the temperature. 2. 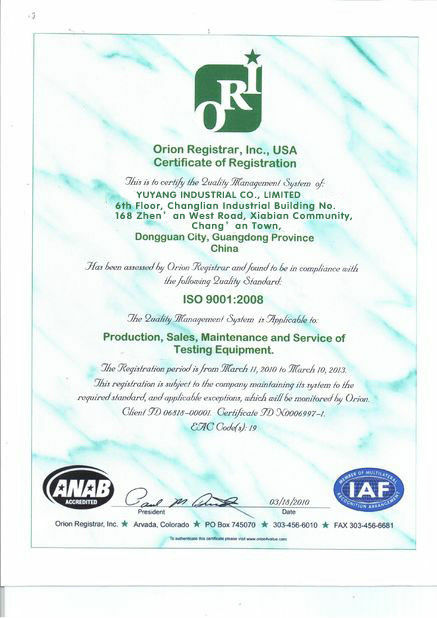 Radiation shield, which is not-water cooled, is consisted of stainless steel, with a total thickness not exceeding 12mm. 3. 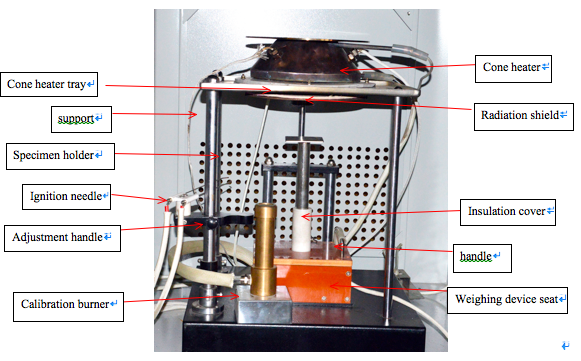 Irradiance control, the system shall be properly tuned so that it maintains the average temperature of the heater thermocouples at the preset level to within ±10℃. 4. 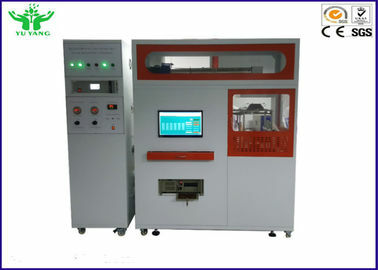 Weighing device, which shall have an accuracy of 0.1g, with a range of 0~2000g. 5. 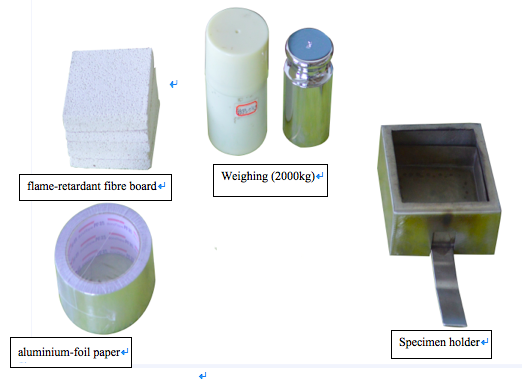 Specimen holder, which shall have the shape of a square pan with an opening of (106±1)mm*(106±1)mm at the top, and a depth of (25±1)mm. The holder shall be constructed of stainless steel with a thickness of (2.4±0.15)mm. 6. Retainer frame, shall be constructed of stainless steel with a thickness of (1.9±0.1)mm, in the shape of a box with an inside dimension of each side (111±1)mm and a height of (54±1)mm. The opening for the specimen face shall be (94.0±0.5)mm*(94.0±0.5)mm. 7. Exhaust gas system, which shall consist of a centrifugal exhaust fan, a hood, intake and exhaust ducts for the fan. 8. Gas sampling apparatus, includes a pump, a filter to prevent entry of soot, a cold trap to remove most of the moisture, a by-pass system set to divert all flow except that required for the gas analyzers, a further moisture trap. 9. Ignition timer, shall be capable of recording elapsed time to the nearest second and shall be accurate to within 1 s in 1 h.
11. 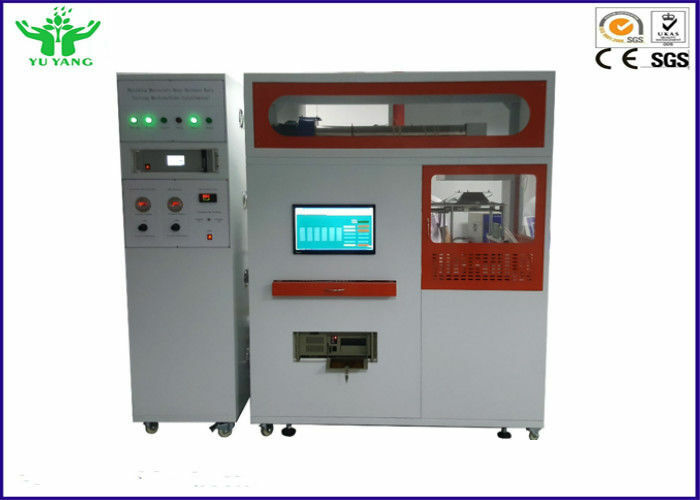 Optical smoke density analyzer, consist of light source, lens, photoelectric element. 12. 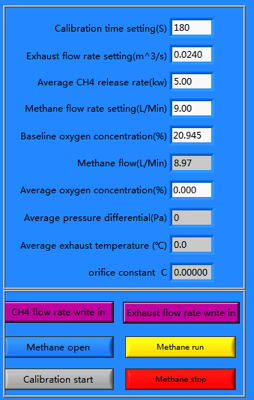 Data collection and analysis system, collect and record oxygen concentration, temperature, heat release rate, theremocouples, heat smoke duct air flow velocity, sample ignition time and extinguish time, total oxygen consumption, mass lose rate, total heat release, carbon dioxide generated curves and carbon monoxide generated curves, all the procedure curves and real-time data, can be printed and saved. 13. 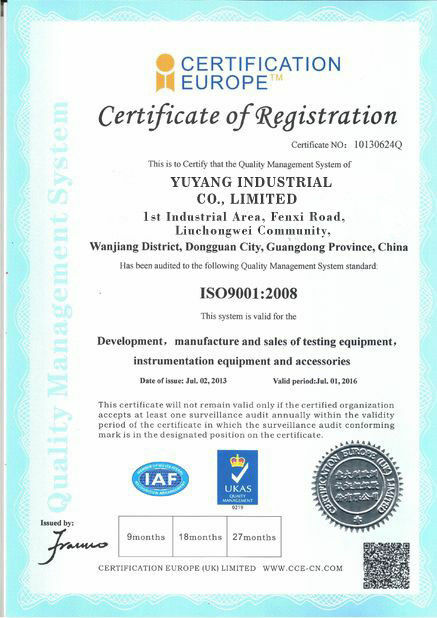 Smoke process system, adopts powerful exhaust system, the equipment is equipped with powerful fan; after finish test, start draught fan to exhaust waste-gas, do concentration purification treatment, in order to meet the standard. 15. Power supply: AC 380V 50HZ total power:6KW.